Patterns and Pressure will feature MCLA student projects printed at PRESS during the Fall semester by students in Professor Mowinski’s Intro to Design and Concrete Poetry classes. Students explored how line and shape can be used to create collaborative patterns and rhythms within compositions. They carved linoleum and then had the opportunity to make their own designs that connected with their fellow classmates’ creations. 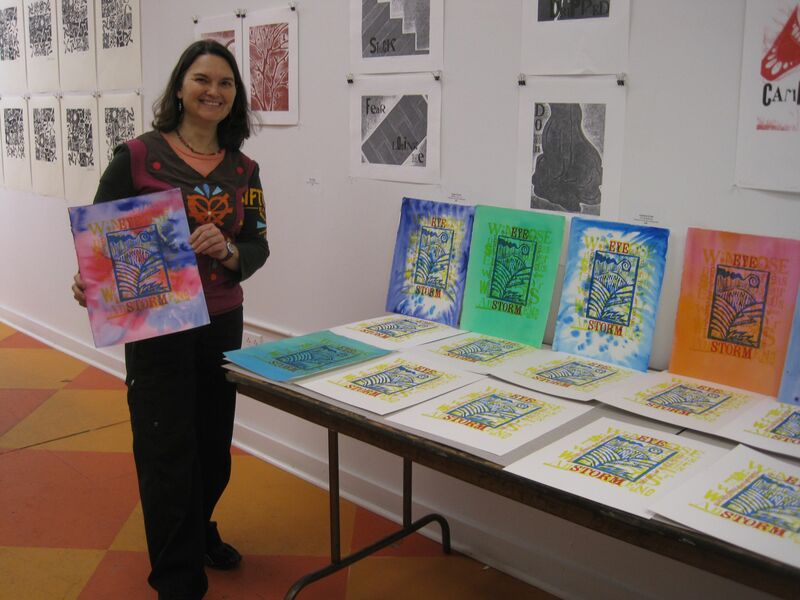 The linoleum will be on view and visitors will have the chance to see if they can arrange the linoleum as the printmakers did. Printmakers otften create portfolios of prints around a particular theme. Each participant designs and prints an image that expresses their visual analog for the topic. Patterns and Pressure includes prints based on the themes RED and Scary Foods. Both of these themes use the special letterpress procoess of pressure printing. Pressure printing is an experimental letterpress technique in which a low-relief collage is made with thin papers/objects, arranged into a composition, glued onto a sheet of paper and then placed underneath the paper to be inked. The resulting image is similar to a rubbing, a bit mysterious, and a great background for other kinds of printmaking.